- All attendees will have a unique opportunity to meet and speak with representatives from various institutions of higher education and organizations serving the Hispanic/Latino community. GoSTEM is a collaboration between Georgia Institute of Technology and the Gwinnett County Public School District aimed to enhance the educational experience of Latino students in Georgia and strengthen the pipeline of these students into post-secondary Science, Technology, Engineering and Mathematics (STEM) education. Please note that they expect a large number of people on March 30, so it’s very important that you plan to arrive at least 15 minutes before the start of the shift you will be attending to allow enough time for parking and registration. We thank you in advance for your cooperation. Seating is limited and reservations will be accepted on a first-time-first-served basis. The reservation deadline is February 15, 2013. 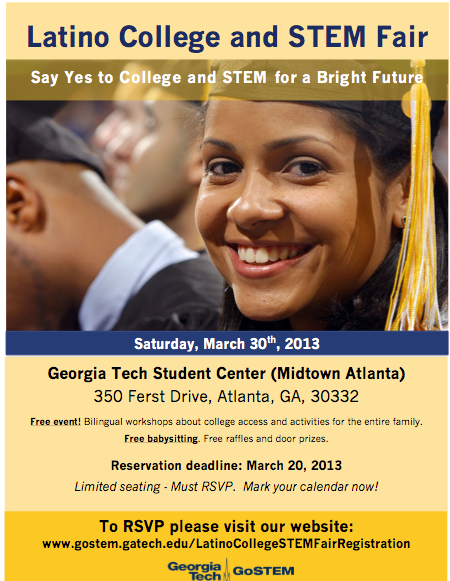 We look forward to receiving your reservation and to seeing you at the Latino College & STEM Fair! To register, for this event in English click here.